If a ball rolls back into a water hazard when taking relief under penalty of one stroke the player must re-drop without penalty – CORRECT (Rule 20-2c). If a ball rolls back into ground under repair when taking free relief the player must re-drop without penalty – CORRECT (Rule 20-2c). If a ball rolls back to where an immovable obstruction still interferes with a player’s area of intended swing when taking free relief the player must drop again without penalty – CORRECT (Rule 20-2c). If a ball rolls back into the same pitch mark from where it was lifted when taking free relief for an embedded ball the player must re-drop without penalty – CORRECT (Rule 20-2c). If a ball rolls back into the same unplayable lie when taking relief under penalty of one stroke from an unplayable lie the player must drop again – WRONG! In this case the player must either play the ball as it lies, or incur another one stroke penalty and drop a ball again under one of the three options available in Rule 28. A few people have suggested to me that this is, “another anomaly in the Rules of Golf, which makes them so difficult to learn”. However, while not suggesting that I am in any way ‘in the know’ as to what goes on when the USGA and R&A meet to determine the Rules of Golf, I do have an opinion on why this apparent inconsistency actually makes perfect sense. Q. A player deemed his ball unplayable and, under Rule 28c, dropped his ball within two club-lengths of the spot where it lay. The ball came to rest in the original position or another position at which the ball was unplayable. What is the ruling? A. The ball was in play when it was dropped - Rule 20-4. Thus, if the ball came to rest in the original position, the player must again invoke the unplayable ball Rule, incurring an additional penalty stroke, unless he decides to play the ball as it lies. The same applies if the ball came to rest in another position at which it was unplayable, assuming that the ball did not roll into a position covered by Rule 20-2c, in which case re-dropping without penalty would be required. Now, let me draw your attention to the fact that the first four situations have defined limits, the margins of the water hazard and ground under repair, the interference area of an immovable obstruction and the actual pitch mark where the ball was embedded. Whereas, because a player may deem his ball unplayable at any place on the course, except when the ball is in a water hazard, there is no such defined limit to take into consideration. Why does this make a difference? Well, imagine a player’s ball lies under a gorse bush, about one and a half club-lengths from the edge. Under Rule 28c the player opts to drop a ball within two club-lengths of the spot where the ball lay, but not nearer the hole. Unfortunately, in dropping the ball in the half club-length area just clear of the bush it rolls the wrong way and disappears back under the bush. 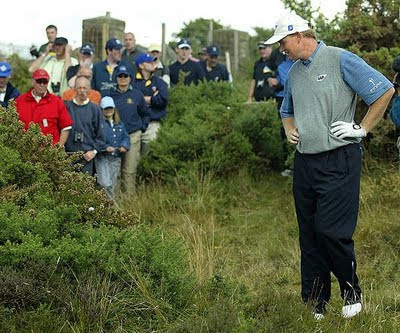 If the Rules permitted the player to deem his ball unplayable again and re-drop the ball without a penalty, he would effectively be given a choice as to whether to play his ball as it lay after the drop, or re-drop it in the hope of getting a more favourable lie. Rule 28 is a self-regulated Rule, with three options as to where the player may drop his ball under penalty of one stroke and once he has chosen he must live with the result of this choice. An unplayable lie is not a ‘condition’ like a hazard or GUR, and an unplayable lie may be very playable for one player and impossible for another. For example, a right-handed player may be stymied by a condition that would not affect the stroke of a left-handed player. The Rules are totally consistent in not allowing players alternative places to play their next stroke from unless there is a penalty stroke incurred in taking relief. Better knowledge of the Rules leads to better play of the game. Author of the book, ‘999 Questions on the Rules of Golf’; the CD, ’99 Golden Nuggets Demystifying the Rules of Golf’; and the iPhone application, ‘Golf Rules Quiz’. By subscribing to the feed at the top right hand corner of my home page you can ensure that you do not miss any of my future blogs. wow - NEVER would have gotten that one. I guess I'm like most people who would assume that a ball rolling back into the same place it was would just be re-dropped as a bad drop - but the explanation makes perfect sense. The trouble is still within the 2 club lengths. If the ball rolls nearer to the hole after you have dropped it at the place that you last played from you must re-drop, Rule 20-2b(vii). I get confused between Rule 20 and 28. In Rule 20, you may not drop a ball in a hazard. However, in Rule 28, it says nothing about that so, if my ball is in tall fescue surrounding a bunker and I elect to use 28 option b, may I drop the ball in the bunker or must I drop outside of the bunker? You may drop the ball in the bunker in the circumstance that you describe. Part of Rule 20-1b, Where to Drop, states; "A ball when dropped must first strike a part of the course where the applicable Rule requires it to be dropped." As there is no restriction in Rule 28 as to where a ball that lies through the green is to be dropped, the player may choose to drop it in a hazard. In fact, this is one of the rare circumstances when a ball may be dropped on a putting green.